Discover the best nature reserves and national parks in Southern Africa as we stay in intimate lodges and go in search of wild game. We explore mountainous Ithala on foot, look for turtles in Kosi Bay and head to Tembe Elephant Park, home of the big tuskers. We cross into the Kingdom of Swaziland and find abundant rhino at Mkhaya whilst staying in stone lodges deep in the reserve. Our final destination is the world famous Kruger National Park, to spot the 'Big Five' and eat a traditional brai. We join our trip in Johannesburg, the largest city in South Africa. After meeting our local guide and fellow group members we spend the afternoon in Soweto, the huge township on the outskirts of Johannesburg where 40% of the city's inhabitants live. Soweto, originally an acronym for South Western Townships, played a prominent part in the fight against the former apartheid regime, notably the uprising of 1976; when mass protests erupted. We will take a tour of the area and meet local people to understand how life has changed since the end of apartheid. We will visit the Hector Pieterson Memorial, a museum that honours the vital role that the youth of South Africa played in the struggle. He was one of the first students to be killed during the uprising when he was just 13. We will also visit Nelson Mandela's former home (now a museum) which tells the story of Mandela and his family. Please note : For those arriving on the earlier flights around 7-8 am into Johannesburg, rooms will be provided to freshen up after a long flight. For those arriving on the later flight nearer to 10am, the trip will kick off immediately with an afternoon trip to Soweto. Today we leave the big city behind and cross the border into the Kingdom of Swaziland; a land of green rolling hills filled with sugar cane and mountainous peaks overlooking vast valleys. We are staying on the outskirts of Mantenga Nature Reserve and the afternoon is free to explore the pristine woodland of Mantenga Nature Reserve. There are many walking trails in the area, a popular one is to visit the Mantenga Falls and it is also possible to hire bikes. Another option today is to visit the Mantenga cultural village, this features traditional Swazi huts, farming techniques and it's very own fully fledged singing and dancing troupe, who are famous throughout Swaziland and even performed at the World Cup in South Africa. Alternatively visit a local market or just relax in our lodge. We cross back into South Africa today and head to Ithala Game Reserve. As we approach we can see Ngotse Mountain, the predominant feature of Ithala, towering over the plateaus, ridges and deep valley. We will arrive in the early afternoon, and after checking into our chalets we will head out on our first game drive of the trip. Giraffe are plentiful and we will also be on the lookout for elephant, buffalo, black and white rhino and a huge variety of antelope; including less commonly seen oribi and tsessebe. It is also possible but rare to see Ithala's resident leopards, spotted hyena and brown hyena. A game walk is one of the best ways of seeing animals and this morning we will meet a local ranger who will take us on an adventure. We will learn about tracks, trails, dung and general bushcraft as we slowly make our way across the reserve. Apart from increasing our understanding of the wild, our primary focus is seeing rhino; these prehistoric-looking beasts were reintroduced to Ithala and have been successfully breeding here. The feeling of slowly and safely walking towards a rhino is always a mixture of excitement, awe and nerves; though we will heed our ranger's guidance and keep a safe distance. After lunch we will wait for the heat of the day to subside before heading out on another game drive. This afternoon we will explore parts of the reserve that we haven't seen yet, which will probably include the Pongola River the top of Ngotse Mountain, which rises to 1400m. Leaving Ithala, we drive towards the Indian Ocean until we reach Kosi Bay, a part of iSimangaliso Wetland Park. iSimangaliso means 'a miracle' or 'something wondrous' in the Zulu language and it is because of the beauty and rich biodiversity that saw the park become a world heritage site. We should arrive around lunch time and in the afternoon we will take a guided walk around the four interlinked lakes of Kosi Bay. The lakes run parallel to the coast, all the way up to Mozambique and we will spend 3-4 hours exploring the area, looking for local birds and being in awe of the sandy beaches and green forested coastlines. Our lodge tonight is close to Lake Nhlange, locally owned and built with to be in tune with traditional architecture. Today is at leisure to explore this wonderfully diverse area, with many activities on offer or just the chance to relax on the beach for the day. Kosi Bay is famous for its traditional and ancient fishing kraals, tendered by the local Tonga people. One of the options today is to have a tour of the kraals and meet some of the Tonga who will tell stories from their culture and explain why they revere their traditional methods. For those seeking a more active morning, it is possible to hire canoes or go snorkelling to see the huge variety of tropical fish found in the estuary. There are also hiking trails throughout the wetland area and the lodge boasts a swimming pool. During turtle season (November - March) it is also possible to see loggerhead and leatherback turtles laying their eggs on the beach. This morning we will drive for a couple of hours until we reach Tembe Elephant Park, our beautiful home for the next two nights. Tembe is renowned for its big tuskers - elephants with huge tusks, but it is also a 'Big Five' reserve, so we will hope to see lion, leopard, black and white rhino and buffalo here as well. We will be staying at Tembe Lodge, a luxurious tented camp fenced in the middle of the reserve, run by members of the local Tembe people, a tribe that has protected and lived in this area for generations. During our stay we will see the park through the eyes of the Tembe people, hear their stories and learn about their way of life. We will have lunch on arrival at the park and then head out on a game drive in the afternoon, stopping at a waterhole to enjoy a cold sundowner- a great way to view game! Dinner will be at the lodge and then we will spend the evening around the camp fire. Today we have a full day of the Tembe experience. After an early breakfast we head out on safari for a few hours, our local guide taking us around the park, looking for signs of big game and pointing out some of the 340 bird species found here. We return to a light brunch and then have a few hours to either relax, sleep, take a trip to the hide to spot more wildlife, eat lunch, cool off in the pool or enjoy a massage at the outdoor (but shaded) spa area, it's a pretty easy life here! We take an afternoon game safari in open sided jeeps to hopefully spot any animals we haven't seen during our stay and then back to the lodge for dinner. After eating we can listen to the soulful singing of the local Isicathamiya group, as we sit by the fire and swap stories. We leave Tembe and South Africa behind and cross back into the Kingdom of Swaziland. We journey to Mkhaya Game Reserve, a haven for many endangered species but best known for its large numbers of black and white rhino; which we will see on our afternoon game drives here. Our accommodation for the night is Stone Camp, a tranquil area which features a collection of stone cottages and is the only lodging in the reserve. The camp is situated on a dry river bed and is surrounded by tall Fig and Sausage trees, which create a lush canopy, attracting many species of bird into the camp as well as some small game like warthogs and impala. Our plan for the day is to take a game walk after arrival, have lunch at the lodge and then head out for an afternoon safari in open top jeeps with a local Swazi ranger. Dinner tonight is a feast of local delicacies, eaten outside under the stars and we will then be entertained as we sit around the fire by a local music group of singers and dancers. Starting the day with a game walk in Mkyaha, we head back out with a guide in search of resident rhino before starting our journey to South Africa's renowned Kruger National Park. We cross the border this morning back into South Africa and drive for a couple of hours until we cross Crocodile River and enter Kruger. Established to protect big game that had been hunted to near extinction, Kruger, is now one of the most prolific animal habitats in Southern Africa and totally committed to animal conservation. We will drive through the park, on the lookout for wildlife until we reach our accommodation. After lunch and some time to let the heat of the day subside, we will be out on safari, hoping to spot rarer sightings such as wild dog or honey badgers. This evening our local guide will cook us a traditional brai - a South African barbecue. Cooking outdoors is an integral part of the South African way of life and we will be able to witness the pride that our Leaders have in their brai cooking skills. This will be accompanied by a wine tasting where we will try some interesting and fun wines from South Africa, chosen by our leaders. As soon as the gates open we wil be heading out on a full day safari to make the most of our last day on safari. 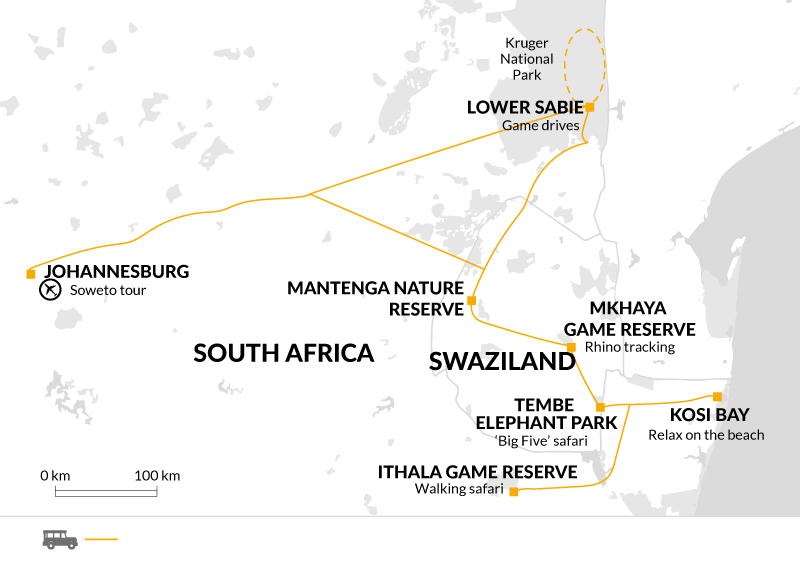 We are staying in the south of the park where we will find the highest concentration of game, this is mainly due to the vast variation in landscapes and habitats that are found here, so this is ample opportunity to tick off the Big Five. Late this afternoon we leave Kruger to make a short journey to Graskop where our lodge is situated by Graskop Gorge Falls. Leaving Graskop early, we make our way to Sudwala Caves. Here we will discover rock formations older than Africa itself, formed millions of years ago when the Earth allegedly still exhibited two 'Supercontinents'. Since the caves were formed they have been home to life through the ages dating as far back as prehistoric humans to the more South Africa War in the late 1800s when it housed hidden ammunition. Once we've had a dose of both geology and ancient history of the area we will begin our final leg of the journey. We will arrive back into Johannesburg around 5pm where the trip ends at the airport; those staying for longer in the area will be dropped at a local guesthouse. Clothing should generally be lightweight for the day . A few warm fleeces and long trousers are strongly recommended as nights can be very cold, especially from May to August and in the highlands of Swaziland. A waterproof and windproof jacket are also recommended, particularly between October and April. Avoid brightly coloured clothing for game viewing. Take a swimming costume. Please note that it is forbidden to wear camouflage clothing in Swaziland. Comfortable walking shoes or lightweight boots for the walking safaris, trainers or sandals for relaxing/travelling. Accordingly, you should allow £20.00 - £25.00 per person for group tipping. This trip features a fantastic range of wildlife lodges which are picked to compliment the intimate nature reserves that we are visiting. In Ithala we are staying in chalets at the foot of a mountain that towers over the reserve. Our accommodation in Kosi Bay feels like a jungle lodge, surrounded by lakes and close to the coast. Tembe lodge is the pick of the bunch and we will be treated like African royalty during our stay. In Swaziland we overnight at Stone Camp, in open cabins in a fenced area in the middle of Mkhaya, we will also stay at the luxurious Mantenga lodge. Our final accommodation is in Kruger and while not as exclusive as our other night stops, it provides us with an excellent base to explore this famous park. This trip is designed for wildlife lovers who want to explore fun and beautiful game reserves and stay in comfortable and interesting lodges along the way. Due to current exchange rates, now is a great time to visit South Africa, meet its friendly people and enjoy the lovely food and drink on offer.